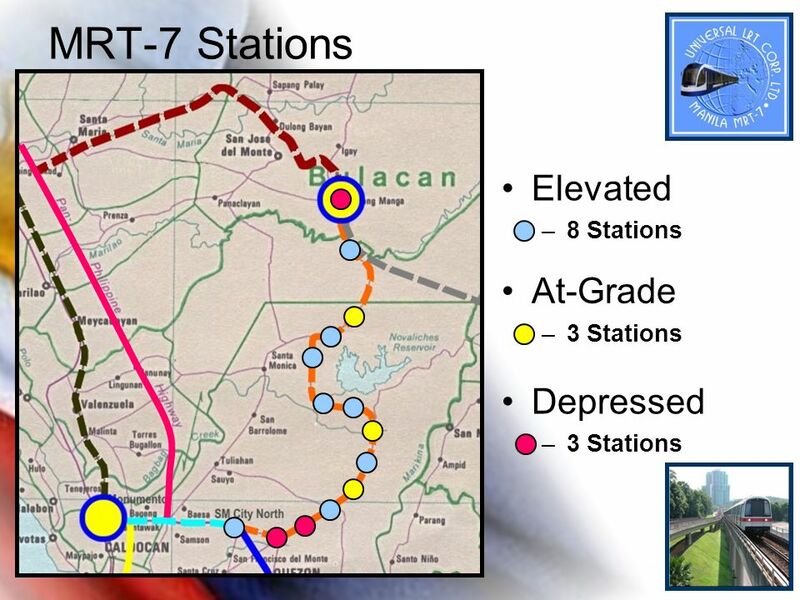 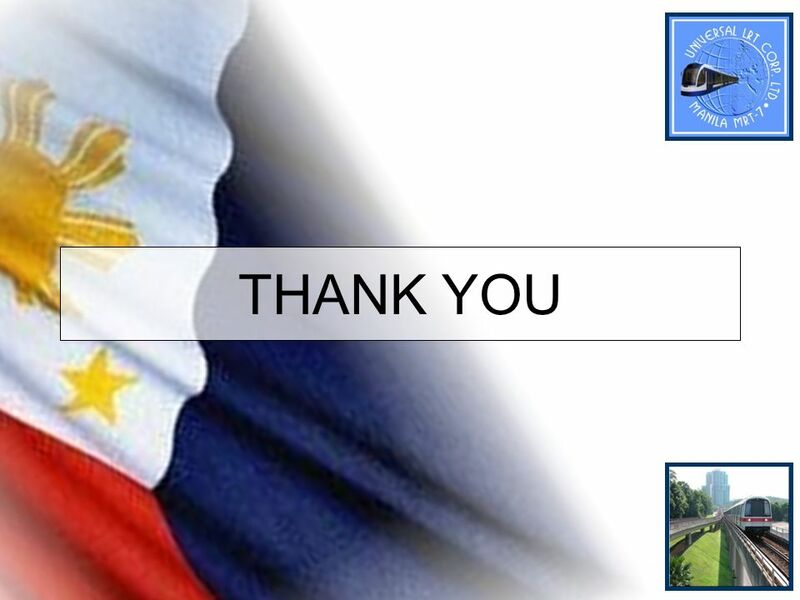 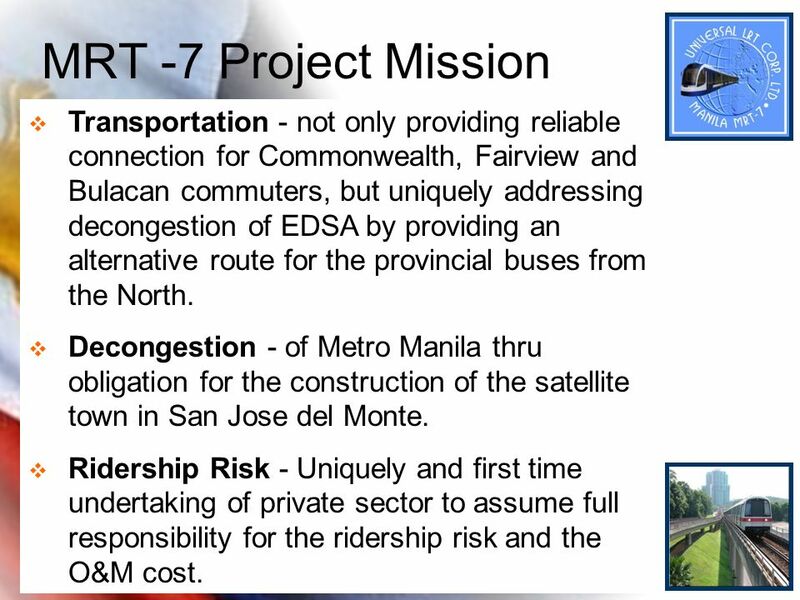 7 MRT -7 Project Mission Transportation - not only providing reliable connection for Commonwealth, Fairview and Bulacan commuters, but uniquely addressing decongestion of EDSA by providing an alternative route for the provincial buses from the North. 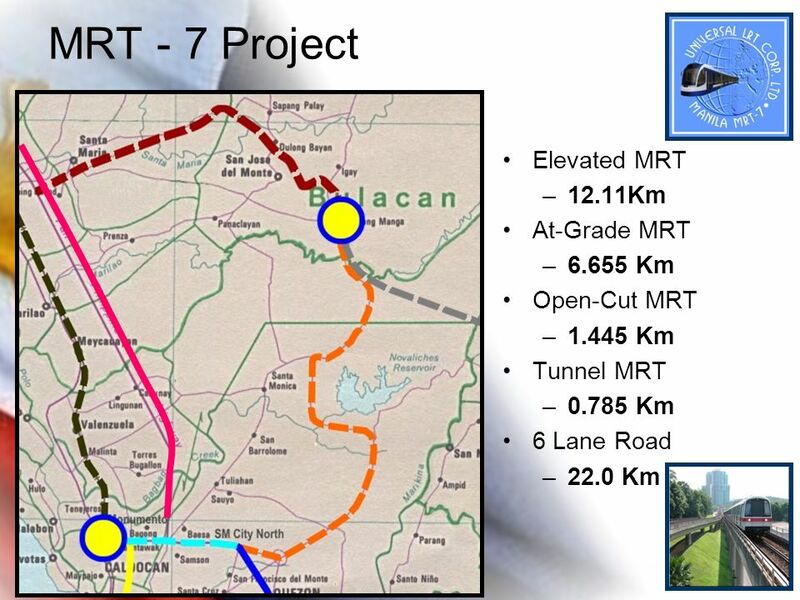 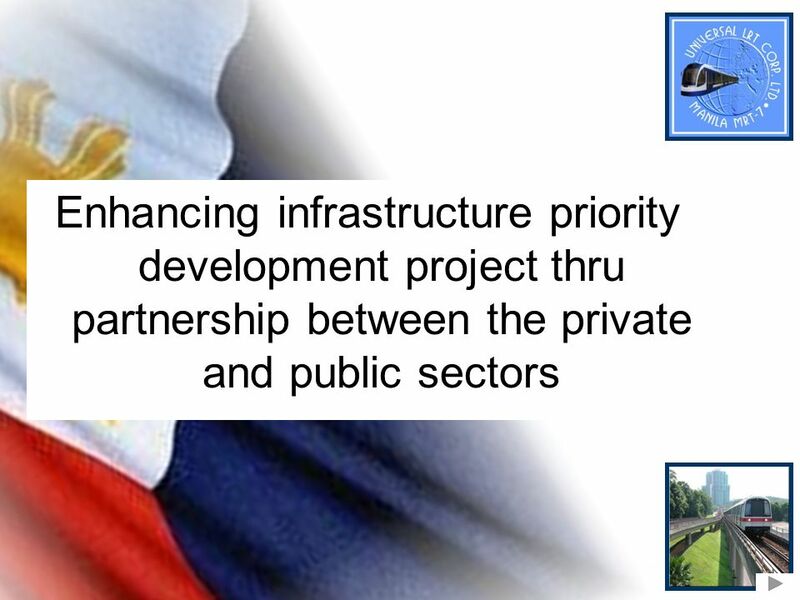 Decongestion - of Metro Manila thru obligation for the construction of the satellite town in San Jose del Monte. 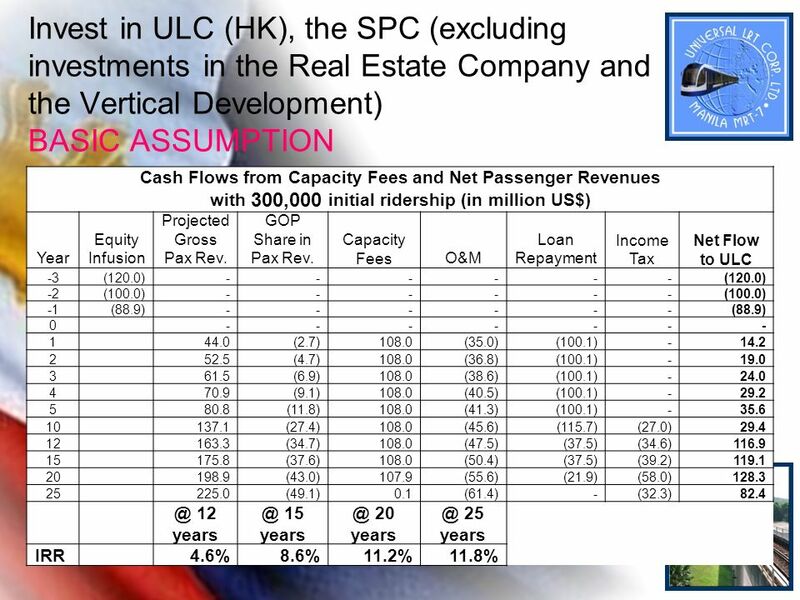 Ridership Risk - Uniquely and first time undertaking of private sector to assume full responsibility for the ridership risk and the O&M cost. 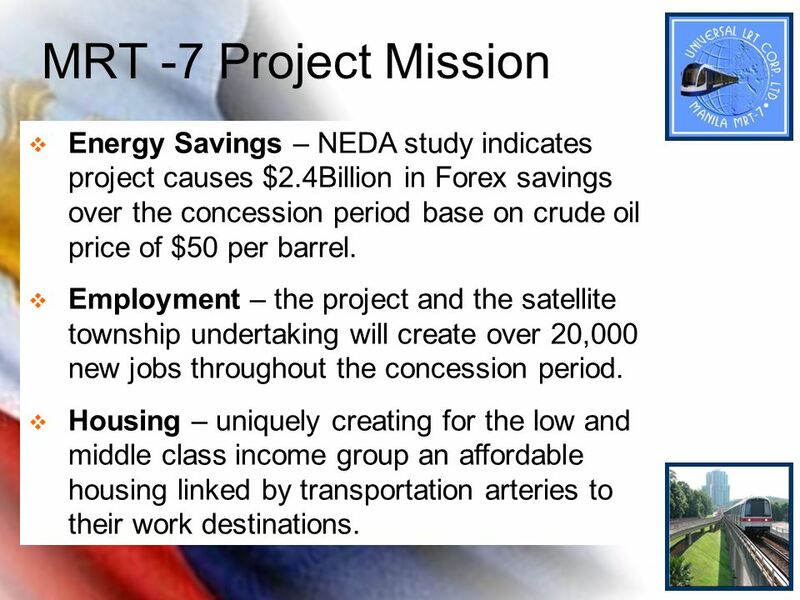 8 MRT -7 Project Mission Energy Savings – NEDA study indicates project causes $2.4Billion in Forex savings over the concession period base on crude oil price of $50 per barrel. 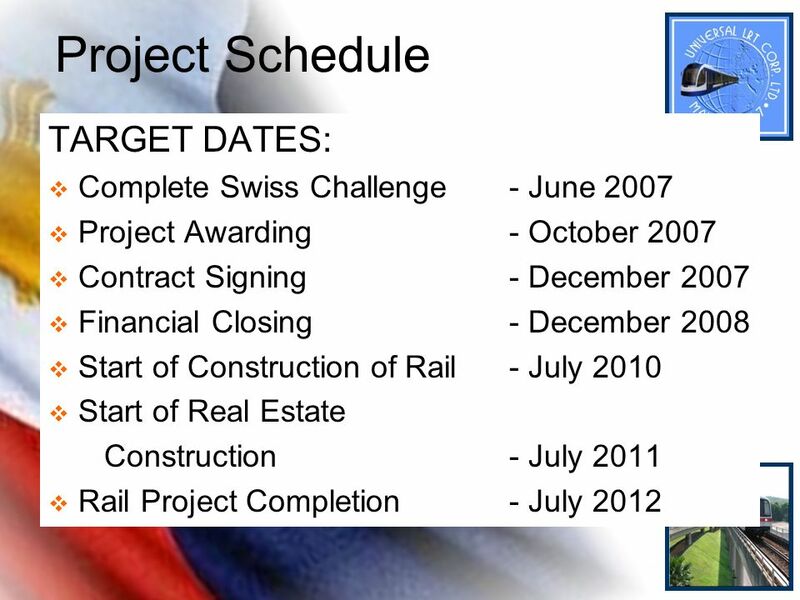 Employment – the project and the satellite township undertaking will create over 20,000 new jobs throughout the concession period. 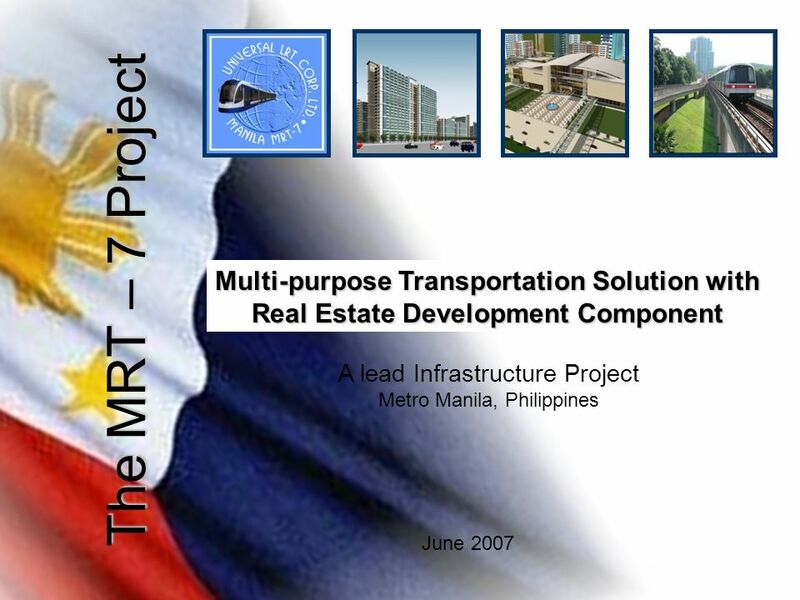 Housing – uniquely creating for the low and middle class income group an affordable housing linked by transportation arteries to their work destinations. 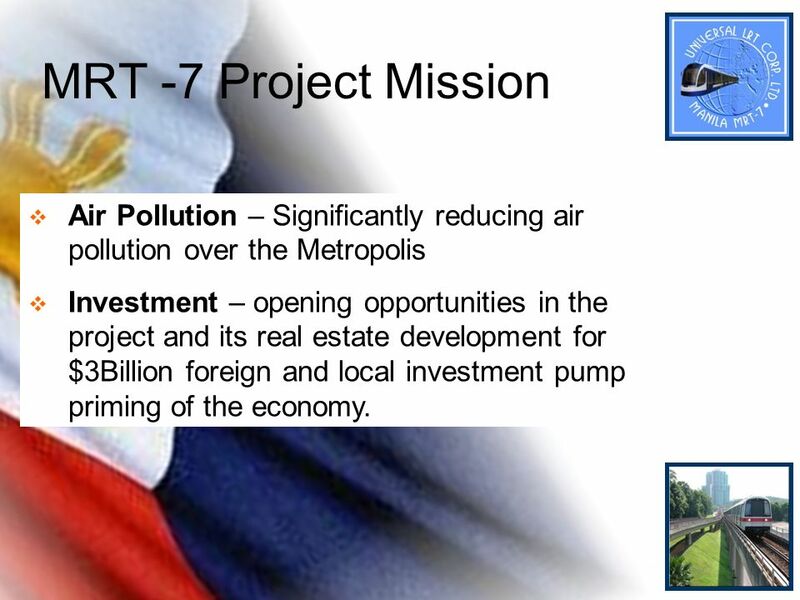 9 MRT -7 Project Mission Air Pollution – Significantly reducing air pollution over the Metropolis Investment – opening opportunities in the project and its real estate development for $3Billion foreign and local investment pump priming of the economy. 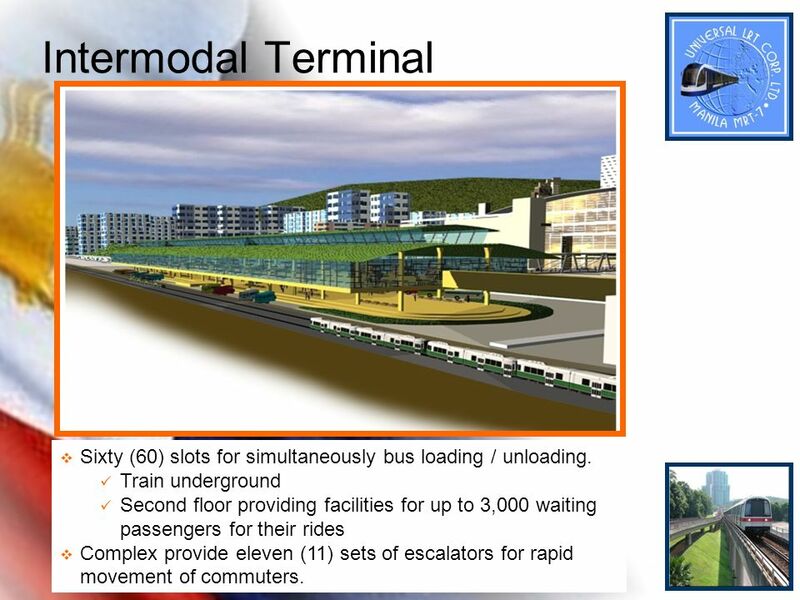 13 Intermodal Terminal Sixty (60) slots for simultaneously bus loading / unloading. 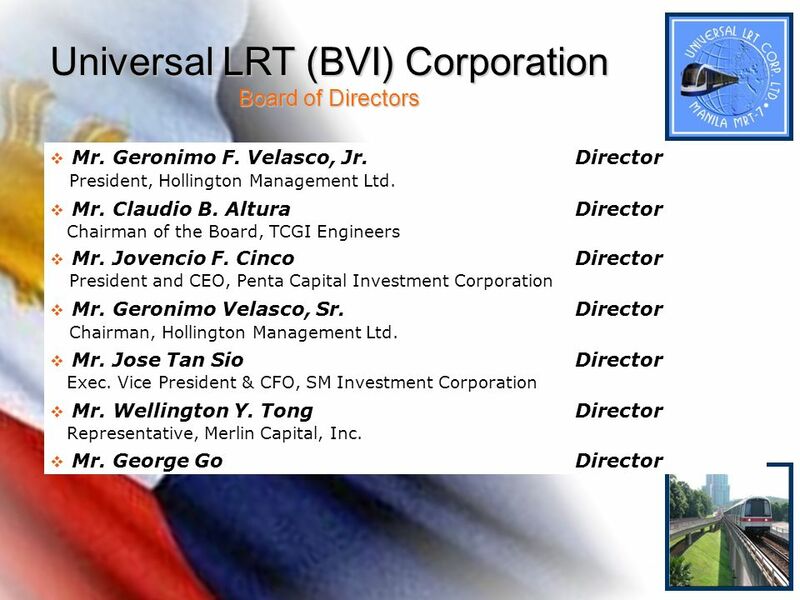 Train underground Second floor providing facilities for up to 3,000 waiting passengers for their rides Complex provide eleven (11) sets of escalators for rapid movement of commuters. 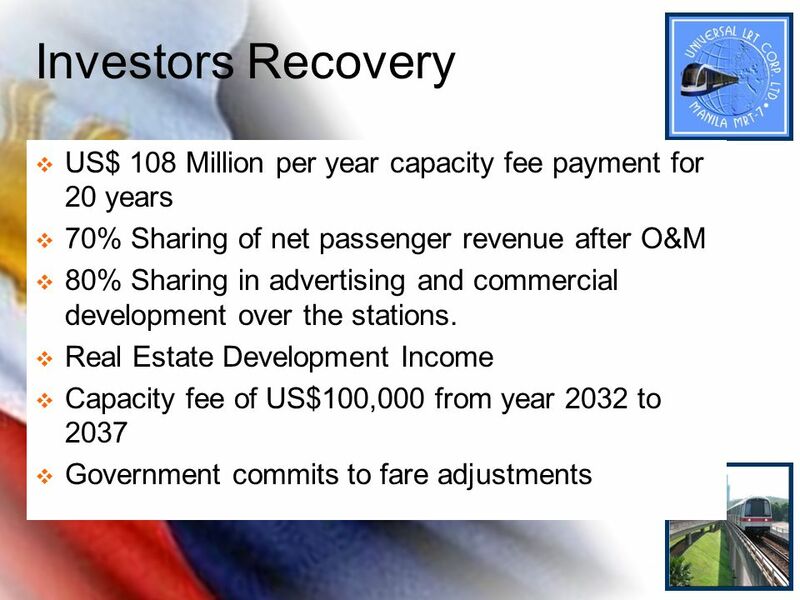 Private investors to develop 2 Million sq. meters residential space 900,000 sq. 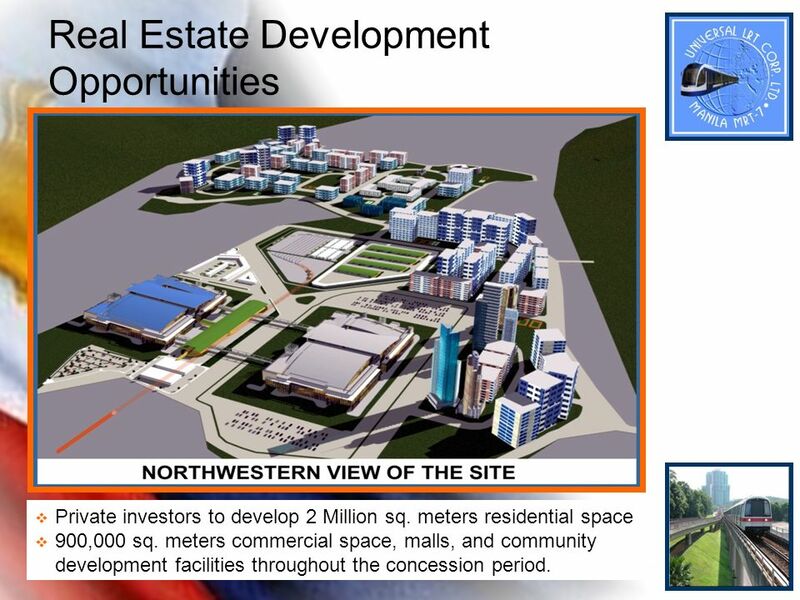 meters commercial space, malls, and community development facilities throughout the concession period. 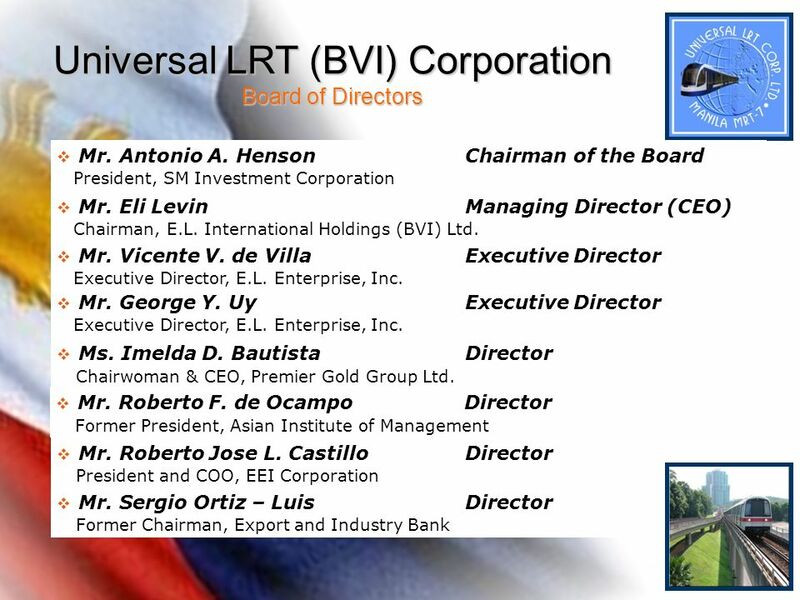 17 Passenger Fare Unified fare is assumed per km for all existing Mass Transit project Fare is based on LRT-1 and MRT-3, 2003 per km and adjusted to reflect inflation and foreign exchange fluctuation. 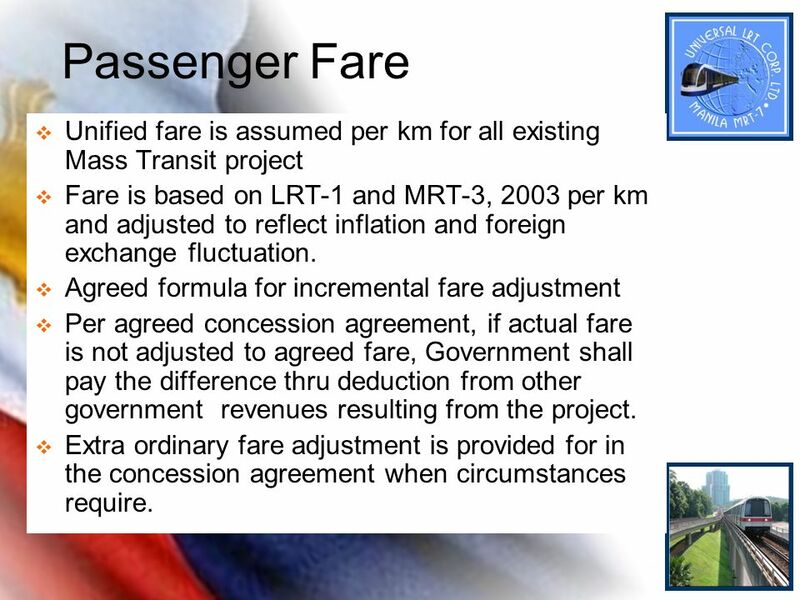 Agreed formula for incremental fare adjustment Per agreed concession agreement, if actual fare is not adjusted to agreed fare, Government shall pay the difference thru deduction from other government revenues resulting from the project. 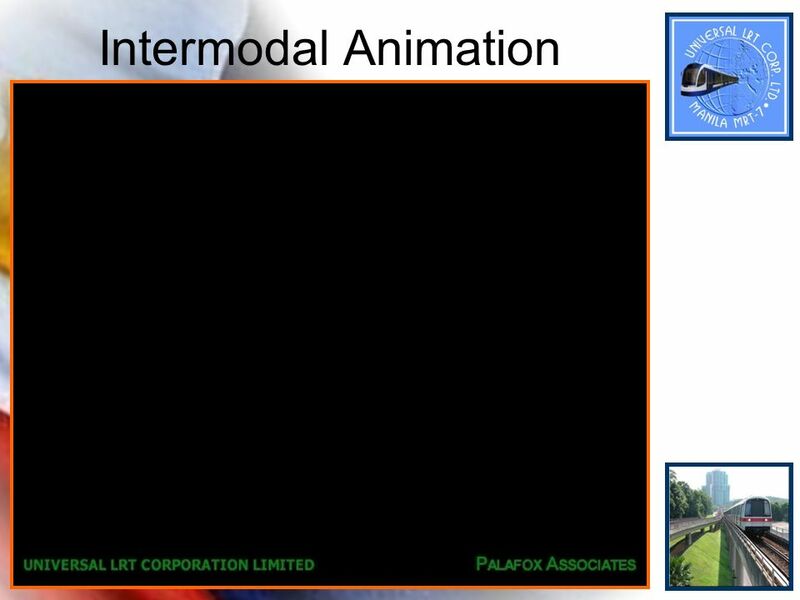 Extra ordinary fare adjustment is provided for in the concession agreement when circumstances require. 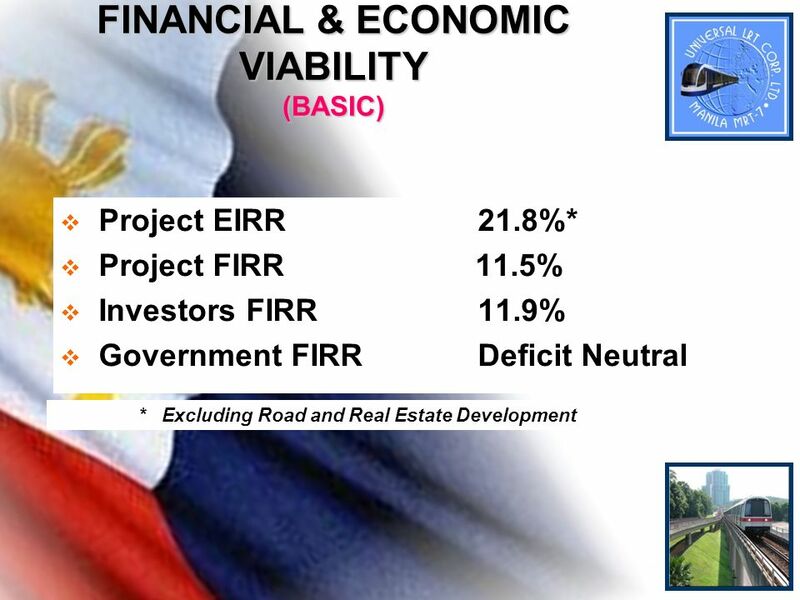 Balanced deficit is consistently reduced Balanced budget projected by 2008 – two years ahead of schedule Continuously reduced foreign debt Inflation much restrained (from Double Digit in the 90’s to around 3% at present) Larger inflow of stable foreign remittances (OFW) Larger tax collection Economic growth in the first quarter of 2007 reached 6.9%, best in 17 years Credit rating is improving and expected to rise next quarter. 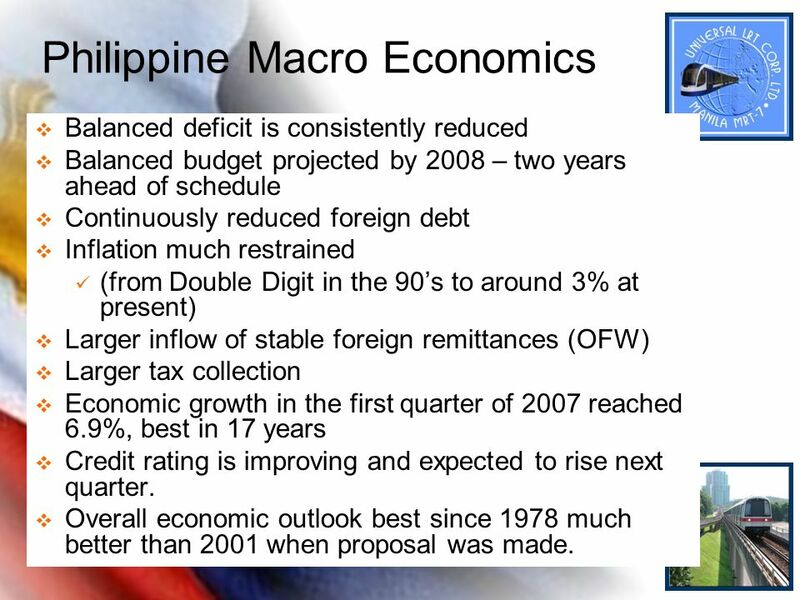 Overall economic outlook best since 1978 much better than 2001 when proposal was made. 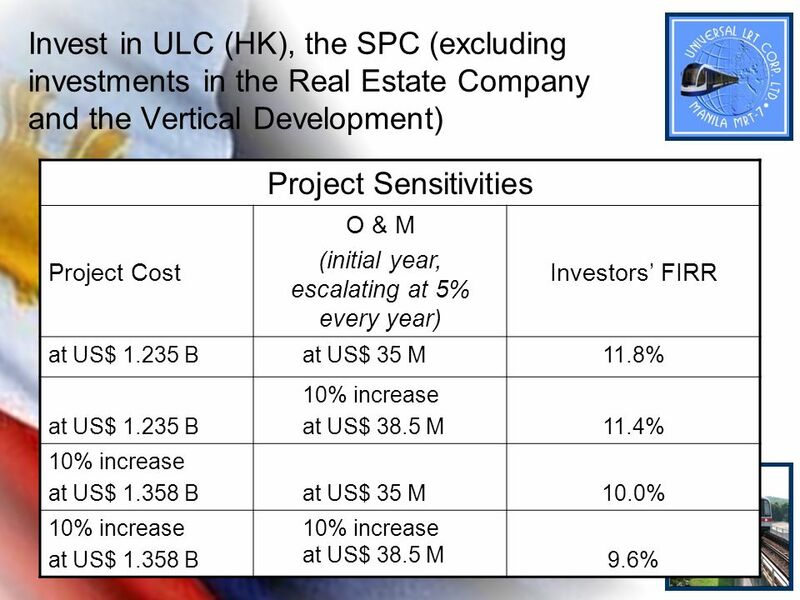 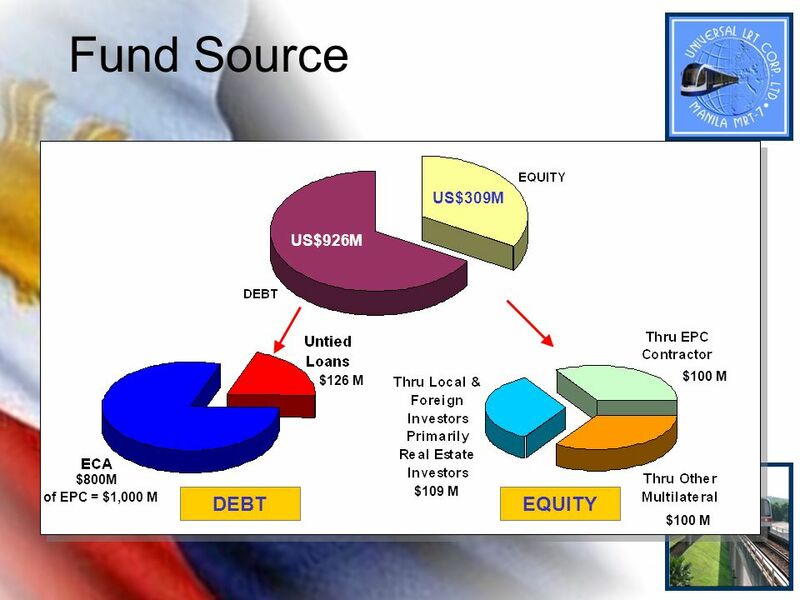 Sovereign risk and risk of repatriation can be insured thru OPIC/MIGA and the like Construction cost is mitigated thru single point of responsibility contract with an EPC contractor at fixed price. 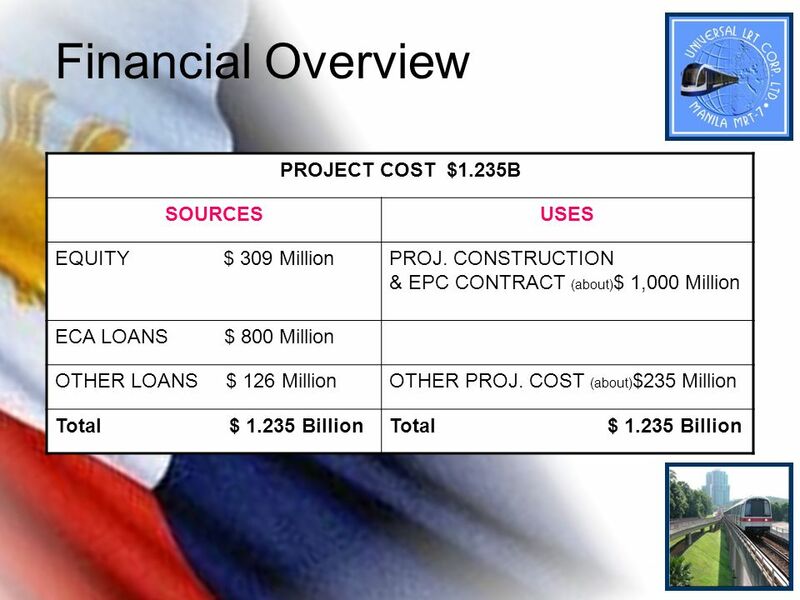 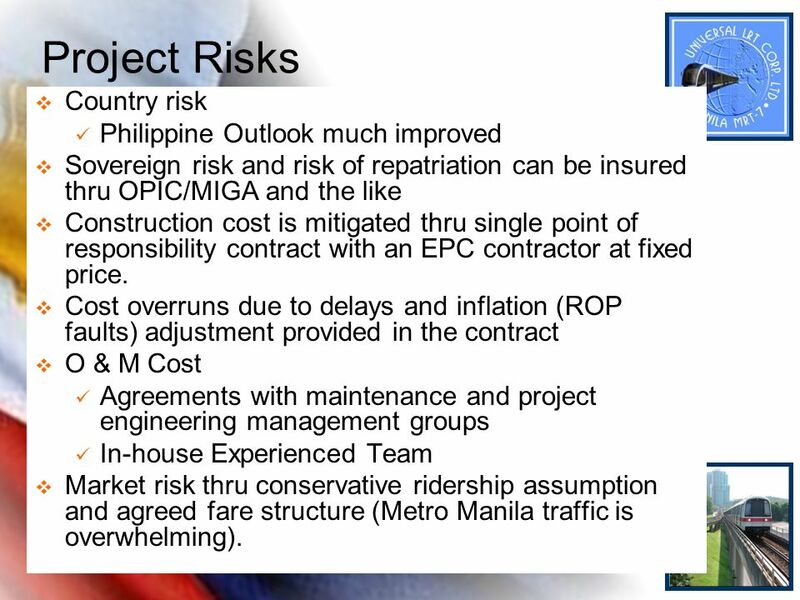 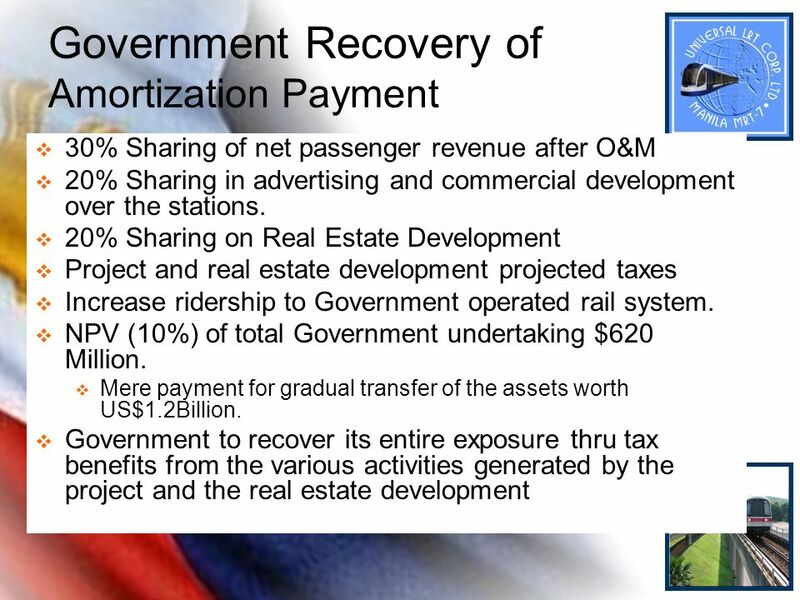 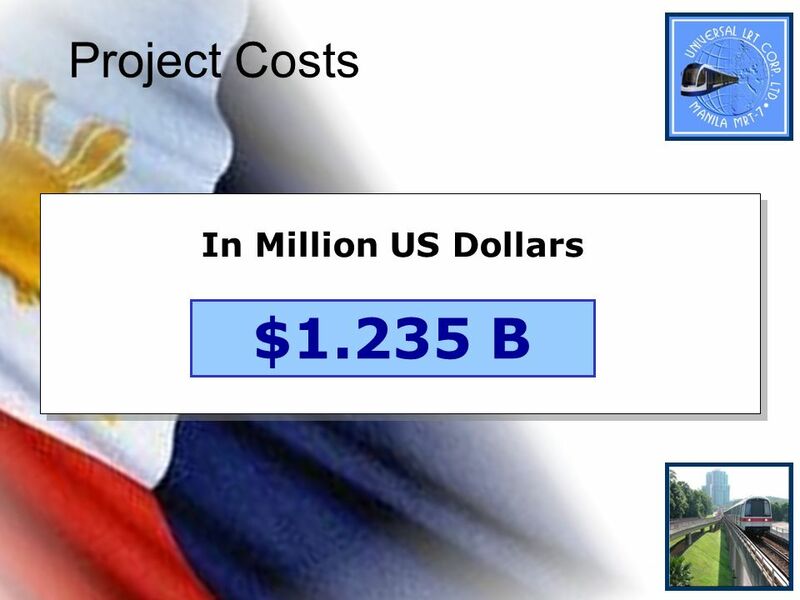 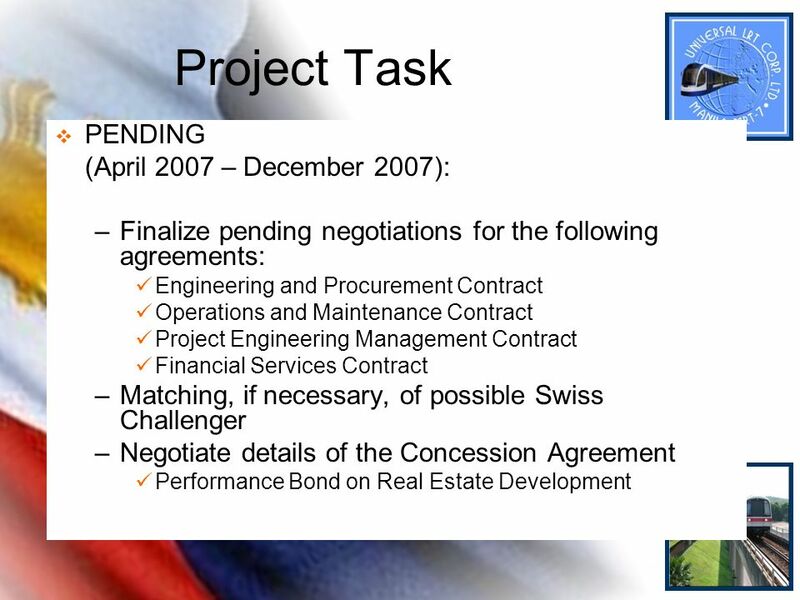 Cost overruns due to delays and inflation (ROP faults) adjustment provided in the contract O & M Cost Agreements with maintenance and project engineering management groups In-house Experienced Team Market risk thru conservative ridership assumption and agreed fare structure (Metro Manila traffic is overwhelming). 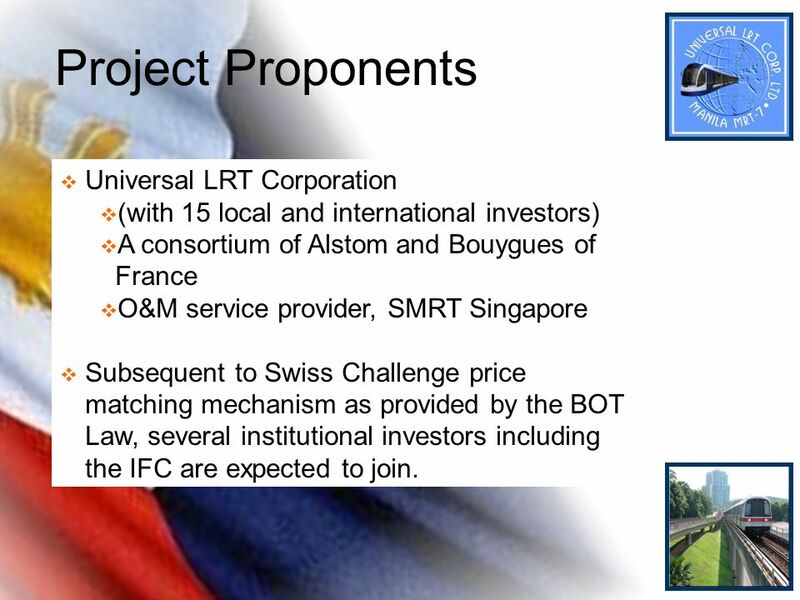 (with 15 local and international investors) A consortium of Alstom and Bouygues of France O&M service provider, SMRT Singapore Subsequent to Swiss Challenge price matching mechanism as provided by the BOT Law, several institutional investors including the IFC are expected to join. 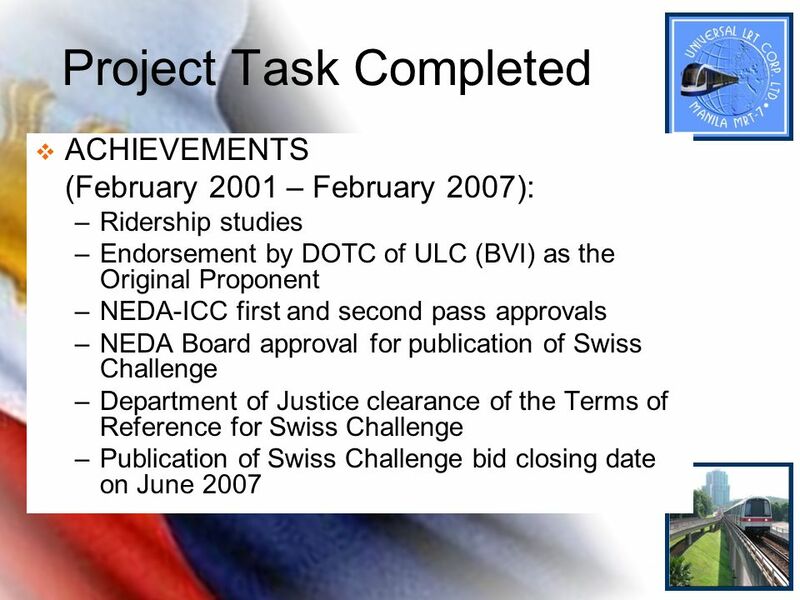 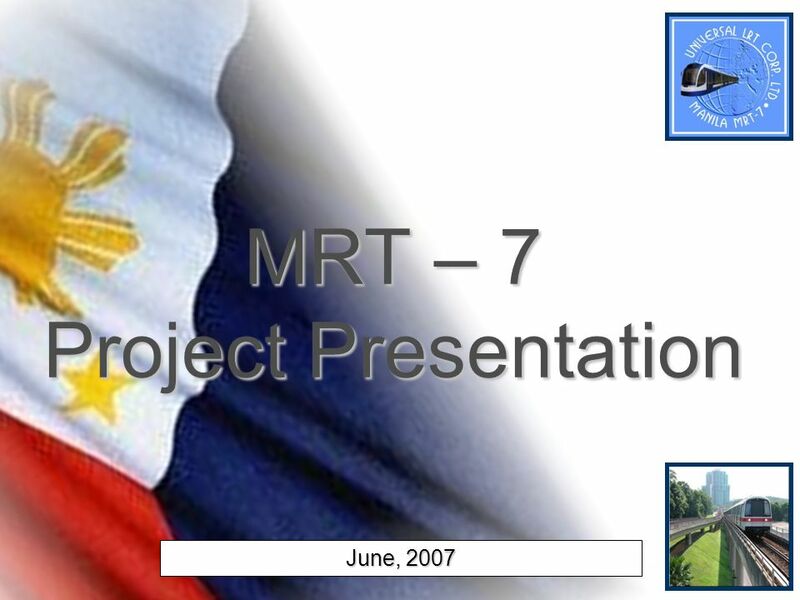 Download ppt "MRT – 7 Project Presentation"